Solution to “java.net.BindException: Address already in use” error? And that worked, but I have to do this EVERYTIME I open Intellij. If I want to rerun the server without exiting Intellij, I can't, because I'll get this error. 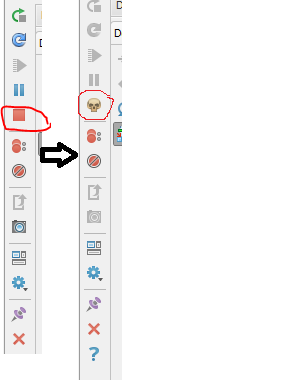 Does anyone know of a permanent fix for this and not just manually killing it everytime? This is due to JMX monitoring the Tomcat instance. Tomcat will be running on port 9999 so when JMX wants to start to check for the shutdown it can't bind to this port. One way to fix this is to define your CATALINA_OPTS environment variable. Setting these properties in JAVA_OPTS tries to start a jmx server when you start tomcat AND when you shutdown tomcat. Hence the port already in use exception. You need to set these properties for CATALINA_OPTS instead of JAVA_OPTS. This will only run when you start tomcat. CATALINA_OPTS="$CATALINA_OPTS -Dcom.sun.management.jmxremote -Dcom.sun.management.jmxremote.port=8999" CATALINA_OPTS="$CATALINA_OPTS -Dcom.sun.management.jmxremote.ssl=false -Dcom.sun.management.jmxremote.authenticate=false"
Click on the skull icon after stopping server to kill all associated processes. This should help in resolving the port issue. I found this questions many times in Tomcat. I ran into this problem, I didnot kill my previous running app on the same port. I just killed it using kill -9 PID and I was fine. Not the answer you're looking for? Browse other questions tagged java tomcat intellij-idea or ask your own question. Can a Spring Boot application be terminated within code when Tomcat server cannot start?